Rogers Digital is an Australian based publisher of a group online magazines. 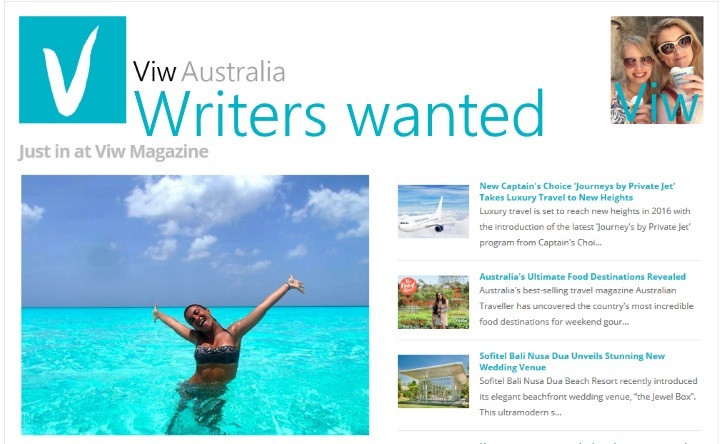 It is seeking writers and columnists... and anyone wanting a start in writing to contribute articles to its two new sites Viw Magazine and AirBTW. Viw Magazine is primarily aimed at Australian audiences. It is looking for people who want to share ( on an unpaid basis ) their knowledge about business, travel, health, real estate, money, lifestyle, motoring, technology, entertainment, sports and fitness, beauty, fashion, interiors, food and beverage or write product or service reviews. Viw Magazine ( www.viw.com.au )will provide a byline and bio with links to websites of people who choose to write regularly or just once. It might be a business tip, a recipe, a "how to" article of a review. AirBTW 9 www.airbtw.com ) is an online Magazine published for people in U.S.A., U.K., Asia and Australia. That magazine is looking for unpaid contributors in its categories that include business, travel, health, real estate, money, lifestyle, motoring, technology, entertainment, sports and fitness, beauty, fashion, interiors, food and beverage. People can send around 600 words and a suitable non copyright image in landscape mode to accompany their work. There is no obligation to become a regular writer or blogger... once is enough or more if it suits. Thee are opportunities to gain experience and build an online audience by way of publishing on websites leading to posting to Facebook and Twitter to boost online buzz. News tips about any event are welcome as well. For publicists, Rogers Digital provides opportunities for interviews for interesting clients to lead to online news reports. Rogers Digital publishes Businesses.com.au for Australia and NewsPronto.com for U.S.A. Writers can send in an article or business news feature for those sites as well.